If you're interested in becoming a member, click here. Thanks! The Oakland Astronomy Club holds regular meetings at 7:00pm on the second Sunday of every month. The meetings are held at the Dinosaur Hill Nature Preserve located at 333 Oak Hill Circle in Rochester. Check out our directions page for information on how to get there. We maintain our own web site to provide information to club members, the astronomy market on the internet, and to attract new members. It is updated periodically with current information. Stop back often! For all other reasons contact the appropriate club officer. Sec. 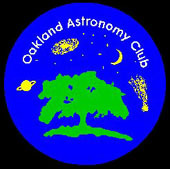 1: The name of the organization shall be The Oakland Astronomy Club (Hereinafter referred to as OAC). Sec. 2: The purpose of the OAC shall be to provide astronomical education, recreation, and research opportunities to the members and the public. Sec. 3: OAC is organized and operated within the guidelines and exclusively for the purposes described in Section 501(C) (3) of the Internal Revenue Code. Sec. 4: No commercial enterprise or candidate for public office shall be endorsed by the OAC. Neither the name of the organization nor the names of its officers in their official capacities shall be used in any connection, partisan, nor their sectarian interest. </script> shall set a meeting time. Sec. 2: Special meetings of the OAC may be called at any time by President or by a majority of the officers. Sec. 1: Five (5) members, including two (2) officers shall constitute a quorum to carry on business at any meeting of the membership. Sec. 1: Election of the officers shall be the first order of business at the last regularly scheduled meeting of the fiscal year meeting of the membership. Officers shall be elected from the membership. Term of office for all officers shall be one year. No person shall hold more than one office at a time. Sec. 2: Officers shall be: President, Vice-President, Secretary, and Treasurer. Sec. 3: Election shall be by secret ballot except for unopposed positions, where election by acclamation may be allowed. Each member shall have one vote. A majority of those voting shall decide the election. Those elected shall assume office on the first day of the new fiscal year. Sec. 4: In case of resignation or vacancy of one or more officers, a special election shall be called by the officers for the purpose of filling said vacancy or vacancies at the next regular scheduled meeting of the membership. Sec. 1: The President shall conduct meetings and represent OAC to other bodies, public and private, as may be required. Any agreements made by the President on behalf of OAC are subject to the advice and consent of the membership. The President shall prepare the current meeting agenda at all meetings. Sec. 2: The Vice President shall conduct meetings and represent OAC in the absence of the President. The Vice President shall coordinate publicity, both general and associated with classes and fund raisers, and carry all official correspondence for the OAC as requested by the officers. A file of all such correspondence shall be kept. Sec. 3: The Secretary shall record and keep on file all minutes of meetings, and shall prepare and distribute copies of the previous meetings minutes. The Secretary shall keep on file all meetings minutes and reports of the officers to the membership. The Secretary shall be responsible for the timely publication and mailing of a monthly newsletter, at the expense of OAC. </script> delinquent dues and give quarterly membership report. Sec. 1: Those eligible for membership include those who subscribe to the purposes for which OAC is organized and to which it is dedicated. Sec. 2: One becomes a member of OAC by applying for membership or by a majority vote of the officers. Membership dues shall be prorated quarterly. Sec. 3: New members shall be announced at each meeting. Sec. 5: The President shall appoint liaisons or representatives to outside organizations as the need arises. Sec. 1: OAC may be dissolved upon a 2/3 vote of the membership present at a meeting called for such purposes, as hereinafter set forth. Sec. 2: Written notice of a meeting for the purpose of dissolution of OAC shall be given to each OAC members at least ten days prior to the proposed meeting, setting forth the day, time, place and purpose thereof. Sec. 3: In the event of dissolution of OAC, all assets real and personal of OAC shall be distributed to such organizations as are qualified as tax exempt under Section 501 (C)(3) of the Internal Revenue Code, or the corresponding provisions of a future United States Internal Revenue law. Sec. 1: Roberts Rules of Order Revised shall govern the conduct of all business meetings of OAC, except where expressly provided. Sec. 1: The fiscal year of OAC shall be the calendar year. Sec. 2: The officers shall prepare, approve, and amend the budget for the OAC. Sec. 3: Expenses of more than $ 100 not included in the yearly-approved budget must be approved by the officers. Sec. 4: The signatories of the depositories of the OAC are the Treasurer and any other officer. Two signatures are required on any check. Sec. 5: Annual dues for the membership shall be voted upon and due at the first meeting of the fiscal year. Sec. 1: The officers shall arrange an appropriate financial report of the books of OAC. Sec. 2: The officers may acquire the services of a certified public accountant at their discretion. The certified public accountant shall not be an officer of OAC. Sec. 3: The annual financial report shall be available to the members and shall be kept on file. ARTICLE XI: By-laws may be amended, revised, repealed or created by a 2/3 vote of the members present at any scheduled meeting, provided one month's prior written notice has been given each member.